With all the wonderful Fall flavors going on right now, you’re guaranteed to love this homemade Apple Pumpkin Spice cake! Apples and pumpkin are in season right now and they pair so perfectly together! Mix in some ground cinnamon, clove and nutmeg…top it with a creamy butter and spiced rum glaze and this homestyle bundt cake is guaranteed to be one of your families Fall favorites! I wondered if I was behind in posting my Fall recipes this season because I’m seeing some fabulous and mouthwatering Fall recipes out there! But to be fair, today is September 18th and it really doesn’t register in my mind that the Fall season is in full swing until we reach October 1. No, but seriously…I’m very excited to start posting some really yummy Fall recipes. This Apple Pumpkin Spice Cake is my first this Fall season and it turned out so amazing!! And I love the Butter Rum Glaze! 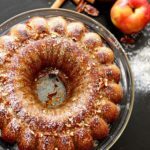 It provides that warm spiced “pop” this bundt cake needs! Ok, so this Apple Pumpkin Spice Cake!!! So moist and full of your favorite Fall flavors!! I used a honeycrisp apple for this cake, but to be honest you can use any type of apple you want! There are so many apples in season right now! I have a couple of friends on the east coast who are telling me stories about how they are going outside and picking a Gala apple or a Pink Lady apple from their tree. I’m so jealous! Here is the desert, we don’t have apple trees! Well – we do out in the country towns but not here in the valley! If you wanted to add a hint of tartness to this cake, using a Granny Smith apple would be perfect! So let’s talk about this butter rum glaze for a minute. The key here when making the butter rum glaze is using unsalted butter. Don’t miss that ingredient! There is a big difference when using salted versus an unsalted butter and this glaze will not turn out right if you don’t use unsalted butter. For my rum, I used Captain Morgan spiced rum. It works perfectly with this recipe because the spiced rum compliments so well with the cinnamon, nutmeg and clove! 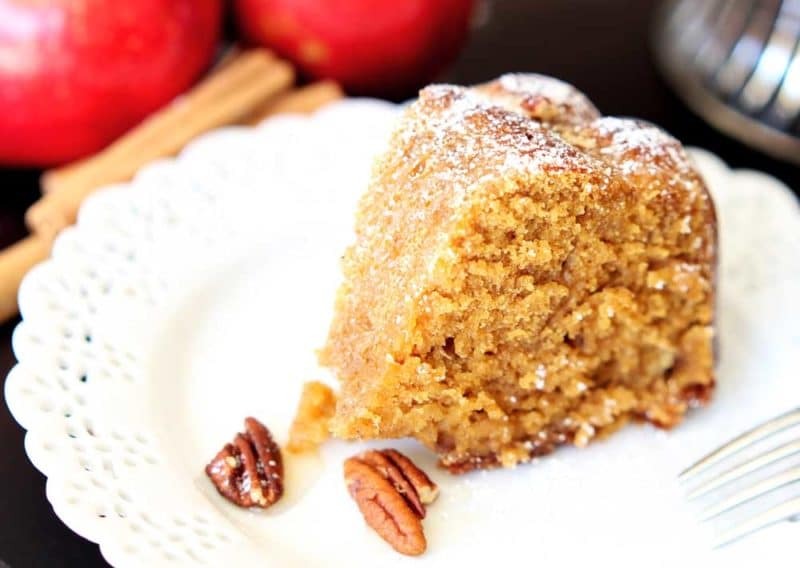 There are so many ways you can top this Apple Pumpkin Spice Cake! I did the Butter Rum Glaze with powdered sugar on top and pecan halves. Those toppings worked really well together and provided a fantastic nut and spice taste! If you don’t feel like making the butter rum glaze, a store bought cream cheese frosting works really well with this cake! Since we are entering the fall season…if you are looking for other Fall Desserts, check out my Zucchini, Carrot and Apple Olive Oil Cake, my Cherry and Apple Cake and my Soft Baked Chocolate Chip Pumpkin Cookies. Oh my goodness, Fall desserts and breads are just the best!! This recipe can be made Gluten Free or with a traditional wheat based flour. I’ll give you the specifics below on how to substitute. Enjoy this yummy dessert (ok, breakfast or snack, too!) Happy Fall Eats! With all the wonderful Fall flavors going on right now, you're guaranteed to love this homemade Apple Pumpkin Spice cake! Apples and pumpkin are in season right now and they pair so perfectly together! Mix in some ground cinnamon, clove and nutmeg...top it with a creamy butter and spiced rum glaze and this homestyle bundt cake is guaranteed to be one of your families Fall favorites! Turn your mixer on low for 30 seconds, then turn the speed up to medium high and mix for 3 minutes. Pour your batter into the bundt cake mold. Heat the unsalted butter in a pan until melted. Stir in the powdered sugar and spiced rum. Stir in the water and stir until the consistency is of a thick syrup. Pour on top of the bundt cake and serve. If you are not Gluten Free and using a regular flour, you can use 2 cups of flour as opposed to 2 1/2 like it calls for in the Gluten Free version. Save this to your favorite FALL FOOD or DESSERT board on Pinterest! > making bundt cakes and to be honest, I never liked them. pshaw… I never met a cake I didn’t like. 😉 this one looks beautiful though and gives me the Fall feelies! Ha!! Well that’s true – Cake is amazing BUT I’m serious…my grandmother’s bundts were SO dry!! She’s 87 now. I should make one with her so I can show her how to make it moist! I think they were so scared of adding oil or butter to cakes back in the day…who knows LOL! The cake looks superb.. so festive this up coming fall. Thanks! I hope you find time to make it!! This recipe sounds so good! The recipe calls for 2/3 cup shortening, you note that you used melted Crisco. Can canola oil be used, or will it change the texture or taste too much? Hi there! I’ve never made it with Canola oil BUT I think it would turn out just fine!!! Give it a go and let me know how it turns out!! Can’t wait to hear! This cake is delicious! I used Canola oil in place of the melted Criso. It turned out fabulous! Will definitely be making this one again. YEAH!! I’m SO glad you liked it!! I’ll have to add a note in my recipe card that Canola oil can be used as a substitute! Thanks so much for writing back that you loved it!! Can i use regular all purpose flour instead of gluten free? Hi there – yes you can! just user 2 cups of flour instead of 2.5. Great! Planning to make it tomorrow for friends and family to share on Thanksgiving day. Will share the picture and their feedback 😊Thank you!